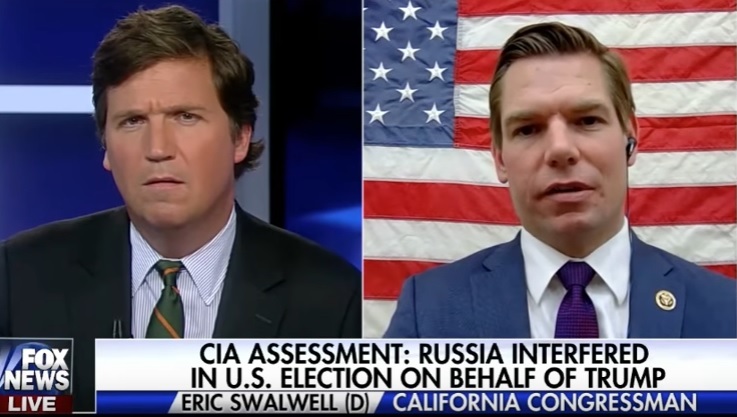 Tucker Carlson absolutely DESTROYED California Democrat lawmaker Eric Swalwell over the alleged Russian hacking of Democratic operatives. Swalwell repeated the liberal talking point that all 17 US intelligence organizations had agreed that the Russians had hacked the DNC and were working to get Trump elected. Tucker corrected him and said that their was no consensus that Russia had hacked the DNC. Tucker also reminded the liberal lawmaker that the FBI and the Director of National Intelligence refuted the claims by the CIA. Wikileaks — the group that released the stolen emails — continues to insist the documents came from a DC insider and NOT from a hacker. Judge Napolitano believes a US intelligence official leaked the documents to Wikileaks. So CLEARLY there is no consensus on who leaked the documents to Wikileaks.